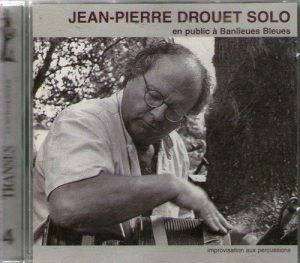 Born in 1935, Jean-Pierre Drouet is first and foremost a French percussionist, closely associated to composers Karlheinz Stockhausen, Maurizio Kagel, Iannis Xenakis and Georges Aperghis, and performers Sylvio Gualda (percussion), Michel Portal (clarinet) and Vinko Globokar (trombone), but he’s also a composer, especially of incidental music to various stage works or music for chorographies. I’ve just reviewed his Variations d’Ulysse on the same label, the music for a ballet of Jean-Claude Gallotta from 1995, commissioned by the Paris Opera. The label is Transes Européennes, founded by percussionist Pablo Cueco in the mid-1990s and whose aim was to “feature the work of musicians that include in their creative approach the existence of cultures other than theirs”. It had very few releases, most of them in Jazz and crossover World-music. 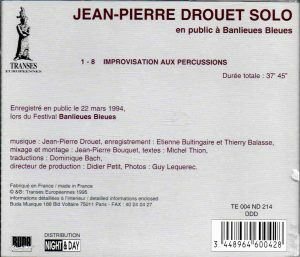 Here we find Drouet in a live impro, recorded on March 22, 1994. It’s sounds like an exploration of sounds, not all “percussive” in the literal sense, especially the bells, cymbals and other metal percussion sounding very “Oriental” (track 1, track 3), although even those are eventually treated percussively and with a strong sense of pulse (end of track 1 & track 2). Membranophones (aka “drums”) are first introduced in track 2 at 3:29, first in a non traditional use involving, if ear serves, brushing the skin surface rather than drumming on it. But all kinds of percussion instruments are used, including mouth harp (track 7) and some that I can’t identify (track 3, I hypothesize one of those toy boxes that imitate the sound of a sheep bleating when you jerk them). It’s a theatre of percussion. Drouet’s theatrical bent – honed in his collaborations with Georges Aperghis, one of the champions of “theatre musical” in France – becomes much in evidence in track 4, when he introduces various and nondescript vocal noises – between a madman’s guttural laughter and the sound of a dog frantically chewing on a plastic ball – and the best part of it is when you hear a kid in the audience himself burst in laughter. Scatting returns in track 8, together with finger snapping, tongue clicking, even sniffing is made into percussion. The piece ends with Drouet mumbling what sounds like “tu veux danser ?” – “you wanna dance?” repeated as “t’en a assez?” “you’ve got enough of it? Me too!” and it’s over. The audience seems to be enjoying itself. It must have been quite a show, and something of it is perceptible on the recording. It’s entertaining. It was a long impro but still adds up to a short total timing of 37:45.